Ivan Dikic is the winner of this year's Young Cancer Researcher Award, given by the European Association of Cancer Research. Also in science and technology news: the World Bank assists with bird flu response in Albania, Romanian mobile phone firms offer video calls, and Microsoft plans to open a support centre in Sofia. 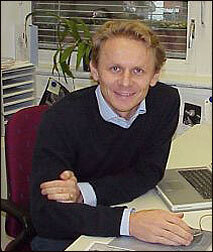 Ivan Dikic of Croatia won the 2006 Young Cancer Researcher Award, given by the European Association for Cancer Research. He was honoured for his contribution to the education and training of molecular biologists in Europe, as well as for the description of a key cellular switch instructing the cell how to respond to DNA damage -- for example by ultraviolet rays from the sun. Dikic, currently with the Goethe University in Frankfurt, has published 78 scientific manuscripts in prestigious journals and has received a number of international awards for his research.